St. Patrick's Day DUI Checkpoints. Plan before you party! St. Patrick’s Day has become one of the nation’s favorite holidays to celebrate, but also one of the most dangerous due to too many people taking to the roads after drinking. According to the National Highway Traffic Safety Administration (NHTSA), 252 people lost their lives in drunk driving-related crashes during the St. Patrick’s Day holiday period from 2011-2015. More than a fourth of them were killed in drunk driving crashes that occurred in the post-party early morning hours (midnight to 5:59 a.m.). For these reasons, the Corona Police Department and the California Office of Traffic Safety are teaming up to reach all drivers with an important life-saving message and warning: Don’t Drive Impaired by Drugs or Alcohol. 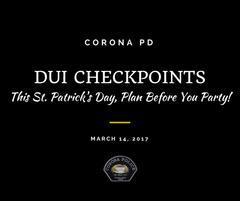 The Corona Police Department will be conducting a DUI/Driver’s License Checkpoint on March 17 at an undisclosed location within the City to specifically stop and arrest drivers showing signs of alcohol or drug impairment. ●	If you’re planning on driving, commit to staying sober. If you’ve been out drinking and then get behind the wheel, you run the risk of causing a crash or getting arrested for a DUI. ●	Drugs including many prescription medications, marijuana or illicit drugs can also lead to impairment and unsafe driving, leading to a DUI. When mixed with even a small amount of alcohol, the affects can be compounded. ●	If you have been drinking, call a taxi, a sober friend or family member, or use public transportation. You can download the Designated Driver VIP free mobile app, “DDVIP,” for Android or iPhone. The DDVIP app helps find nearby bars and restaurants that feature free incentives for the designated sober driver, from free non-alcoholic drinks to free appetizers and more. The feature-packed app even has social media tie-ins and even a tab for the non-DD to call Uber, Lyft, or Curb services. ●	Help those around you be responsible, too. Walking while impaired can also be deadly, as lack of attention could put you at risk of getting hit by a vehicle. If someone you know is impaired by alcohol or drugs, do not let them get behind the wheel and help them find a sober ride home. If you have any information about this operation please contact Sergeant Michael Nielsen at 951-739-4885 or email Michael.Nielsen@DiscoverCorona.com.